If there’s anything the internet loves more than cats it may be glow-in-the-dark cats. A picture of a cute kitten lighting up with an eerie glow is sure to draw shares and likes. Besides kittens, the internet has served us up glowing chickens, rabbits, pigs, sheep, monkeys, and more. Articles about them (see the links at the bottom of the page) just about always include words like ‘glow in the dark’ in the title. The only trouble with these well-intentioned reports about animals glowing in the dark is that they don’t. If you happened to turn down a dark alley and one of these critters was lurking in the shadows you would see exactly … nothing. That doesn’t mean that there aren’t plenty of organisms that legitimately glow in the dark. Fireflies are the most familiar example for most people, and on land there are other examples like glow-worms in caves, a cool beetle that has eyes that shine like green headlights, some mushrooms, and more. The light in all of these legitimately glowing cases comes from bioluminescence. The energy needed to create the emission of light is produced by chemical reactions going on inside the organisms. They have the native ability to make light on their own. There is a lot more bioluminescence in the sea, where it performs a variety of functions for animals either at night or in the permanent darkness of the depths. You can go to Bioluminescent Bay in Puerto Rico for a phenomenal glow-in-the-dark experience. Back to the cats and other animals. They don’t have the internal chemistry to glow in the dark on their own. You can talk to them nicely, startle them, slap them around, and they just won’t light up. Bite or scratch you, maybe, but no light. So where does that eerie ‘glow’ you see in the pictures come from? The answer is fluorescence, the process by which light of one wavelength (color) is absorbed and light of a different wavelength (color) is emitted. When those pictures of cats, sheep, and everything else are taken, someone (out of the picture) is shining a light of a different color, usually ultraviolet or blue, on them. This is not a natural property. The light emission is coming from fluorescent proteins that scientists have introduced into the animals so that when some part of their body is made as they develop, they also make the fluorescent protein. The scientists didn’t do that just because they were bored and wanted to make cool pictures. In all of these cases they were using the animals for some form of important scientific research. In the case of the cats they were studying something in the blood that provides resistance to feline AIDS. In the case of the chickens it was related to avian flu. These are very worthwhile things to study. The fluorescent proteins were not added to have any influence on the research itself, but rather to make the work more efficient. The challenge is biology. The offspring of any of these animals don’t necessarily inherit the interesting biological trait that the scientists are studying. If you were to look at a litter of kittens, for example, it wouldn’t be obvious which ones have the AIDS-resistance trait and which ones don’t. The old-fashioned, time-consuming way to find out would be to draw blood from each one and analyze the DNA to read the gene sequence. Wouldn’t it be nice if you could tell just by shining the right light on them and looking at them? This is where the fluorescence comes in. The light that is emitted from those kittens that fluoresce – but don’t ‘glow in the dark’ – immediately tells the scientists which ones they should work with in the next stage of the experiment. 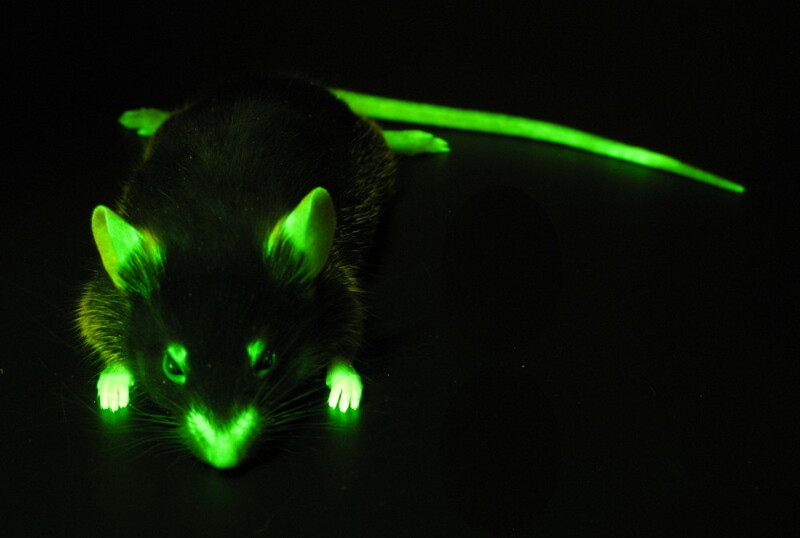 This ability to add fluorescence to living things has been phenomenally valuable for modern biological research. 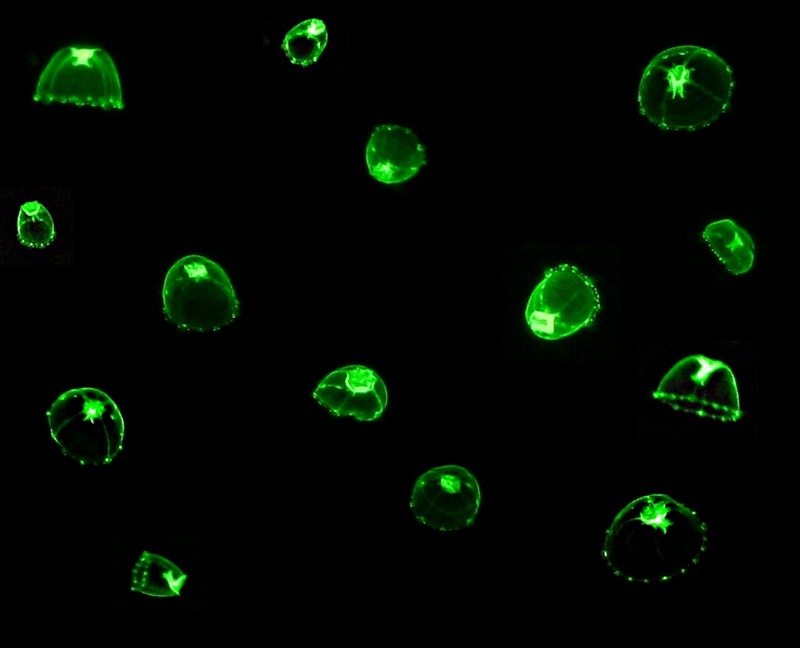 What started with a curious observation in a small jellyfish has proved to be so important that several of the pioneers of the discovery and its application won the Nobel Prize in Chemistry in 2008. Fluorescence is a wonderful thing. It is useful, fascinating, and just downright beautiful. There is no need to call it anything else.